(April 28, 2016) A Town Hall Meeting on pupil assignment is scheduled for Wednesday, May 18, 2016 at 6:15 p.m. at the Olympic Community of Schools, 4301 Sandy Porter Road. 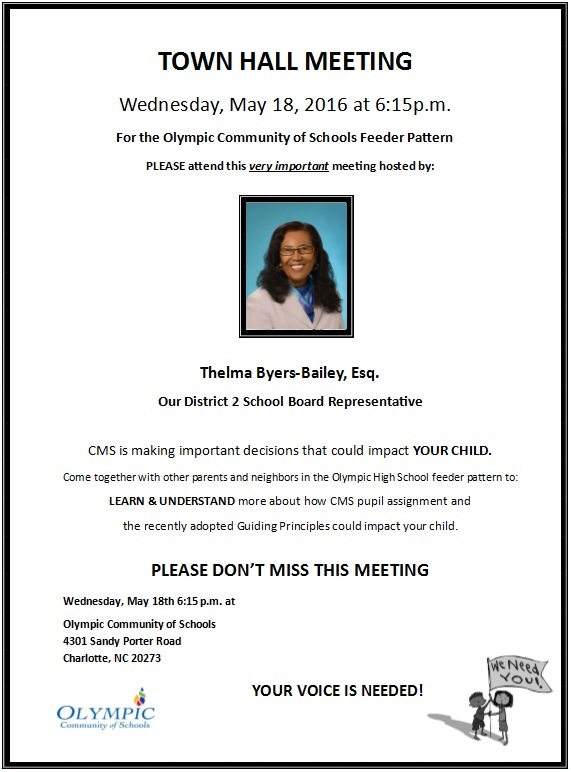 The meeting will be hosted by Thelma Byers-Bailey, the District 2 School Board Representative. Charlotte-Mecklenburg Schools is making important decisions that could impact your child. Come together with other parents and neighbors in the Olympic feeder pattern to learn and understand more about how CMS pupil assignment and the recently adopted Guiding Principles could impact your child.